WHAT IS THE DIFFERENCE BETWEEN CUSTOM AND STOCK CABINETS? Quality and selection: custom cabinets are available in any wood or finish. They are designed and built to fit the exact space available, to meet any function required and in any style you wish. As custom cabinet builders we use the best construction methods and use premium materials and hardware. Stock cabinets are built in standardized widths and lengths, and are only available in a few types of wood and finishes so you are confined to making these standard sizes fit the space available with few configuration options. HOW DO I GET STARTED WITH THE DESIGN PROCESS? Simply contact us with a brief description of your project and make a consultation appointment. We will work with you throughout the project to ensure that the cabinets or built-ins maximize the utility of the space available, compliment the style of your home, and suit your specific needs. Our primary service area is the greater Piedmont Triad area of North Carolina, including Greensboro, High Point, Winston-Salem and the the smaller townships in Guilford County, Forsyth County, Rockingham County and Alamance County. 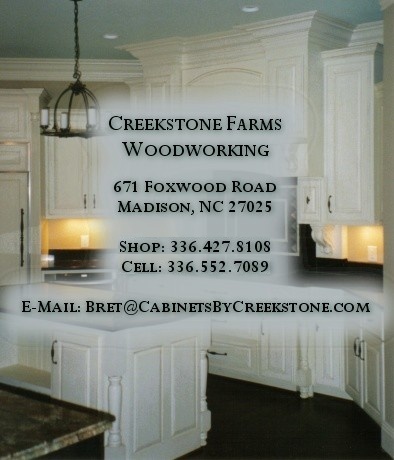 We have traveled as far as Asheville, NC and Charleston, SC to design, build and install custom cabinetry.